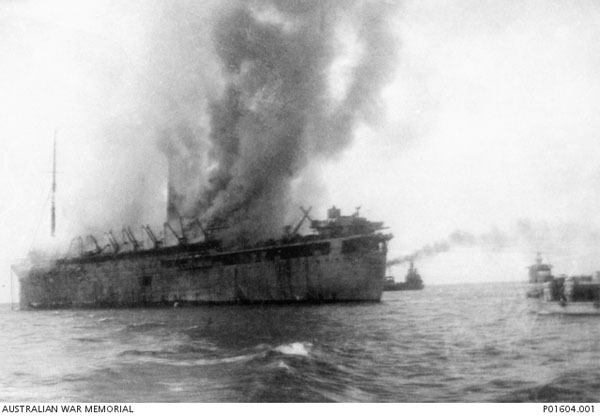 ‘Empress of Asia‘ burning after hit by Japanese dive-bombers. Pacific: Troopship Empress of Asia (16,400t) sunk by Japanese bombers off Singapore. USA: Government declares war on Thailand. Russia: President Kalinin predicts in broadcast that the hour is near when all the occupied Republics of Russia will return to the Soviet Union. Europe: RAF drop 1.4 million copies of 2 American leaflets, describing gigantic US arms programme, over 8 French cities and towns.